One of the Basil leaves, found in Thai kitchen, which easily found anywhere either in fresh markets or supermarkets. The Aroma of this basil will be very special that you will either love it or hate it. 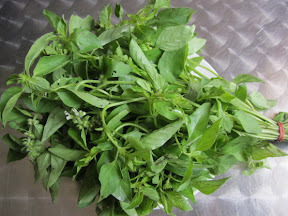 This basil will be use in a lot in North-eastern food. In Central Thai food, you will see them in Gaeng Liang (แกงเลียง) or with vermicelli Rice Noodle with fish curry sauces ( ขนมจีนน้ำยา ). You can get them in most Asian shops. The best is to use them up when they are fresh. Normally, they don’t stay fresh very long.